Sabrina Nishijima is the author of the book 1,001 Things To Do In Sacramento With Kids (& The Young At Heart) and is the creator of Sactown Kids. She lives in Sacramento with her husband, two kids, and their three-legged dog. She created SactownKids.com to share her love of family adventures in Northern California. Follow her on Instagram at @sactownkids. 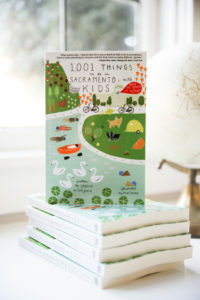 Sarah Golden is the illustrator of the book 1,001 Things To Do In Sacramento With Kids (& The Young At Heart). She lives in Oak Park with her husband, twin girls, and Boston terrier, Captain. She can be contacted at her website sarahgolden.org and on Instagram @sarahgoldenart. To say Hi, please e-mail hello@sactownkids.com. Thank you!